Located just north of the Markham Woods luxury corridor just off Markham Road, Buckingham Estates is a well-kept gated and guarded community. The homes here are both custom and production-built. The Seminole County bike trail runs right along the community - making for easy access by its residents. The trail runs throughout Seminole County. 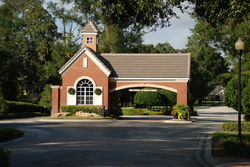 Excellent shopping and fine restaurants are close by in both Colonial Town Park and Park Place. In addition, I-4 is two miles away for an easy communte into Orlando to the south or Daytona to the north. Contact Us if you would like to tour this community or any other community to find your next home!